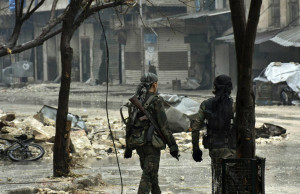 Syrian troops and pro-government gunmen marching through the streets of east Aleppo, Syria, on Tuesday. The U.N. and opposition activists reported possible mass killings by government forces closing in on the rebels' last enclave. Syrian troops and pro-government gunmen marching through the streets of east Aleppo, Syria, on Tuesday. The U.N. and opposition activists reported possible mass killings by government forces closing in on the rebels’ last enclave.